Great day on Lake Michigan with a mixed bag of fish. Spent some time looking for perch, but only located a few. Hope to see more schools of perch in the next few weeks. 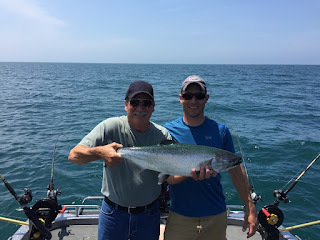 Moved offshore and after missing a few hits found a lake trout and king salmon for Dad to reel in. South Haven continues to produce some nice trout and salmon for those putting in their time. Try water 80-100' and keep a few high lines in your spread.